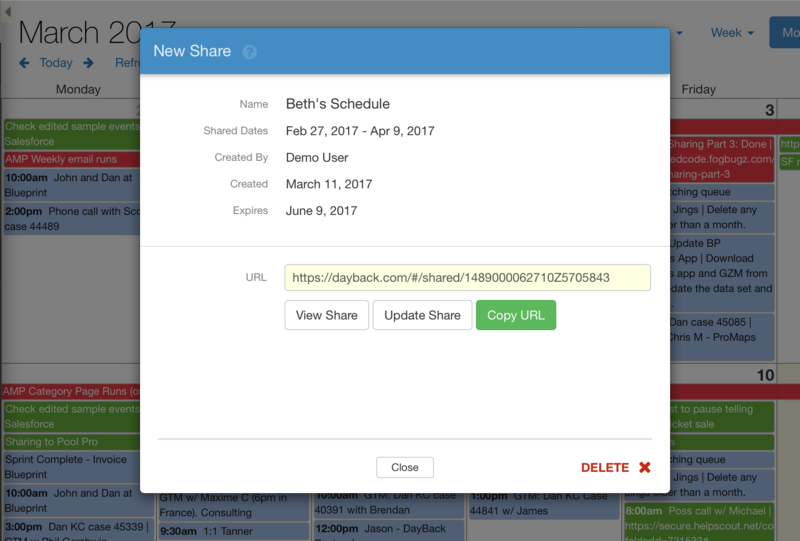 Sharing lets you send a specific calendar view to folks who don't have access to your FileMaker solution. When you make a share you'll be creating a URL that contains exactly what you currently see on screen in DayBack. You can see sharing in action here: sharing overview. Adding sharing to your file is easy if you're using an up-to-date copy of DayBack. Instructions for activating sharing in your copy of DayBack for FileMaker, and for getting your copy up-to-date, are available here: Enable Sharing. Expiring and Deleting Shares. 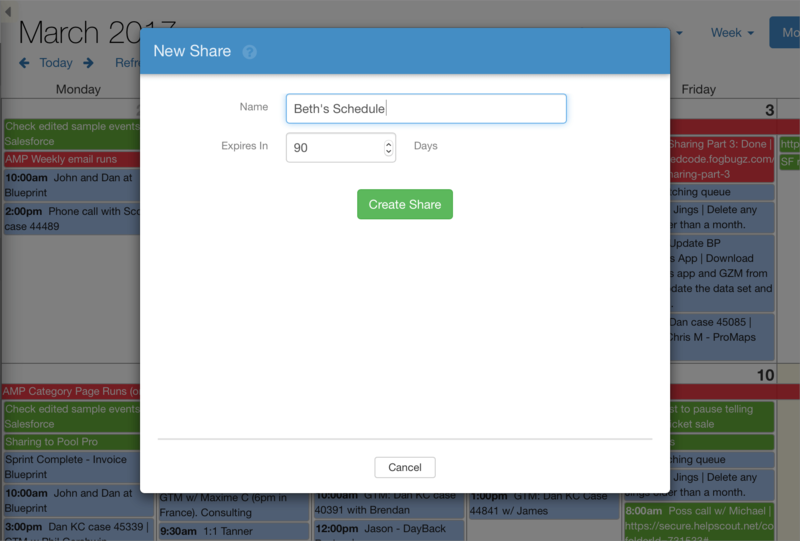 From the Share menu in DayBack, click "Manage Shares" and you'll see all the views your group has shared. Deleting a share here will prevent recipients from accessing the share again. The share will behave as if it's expired and users will see a note saying the share can't be found. 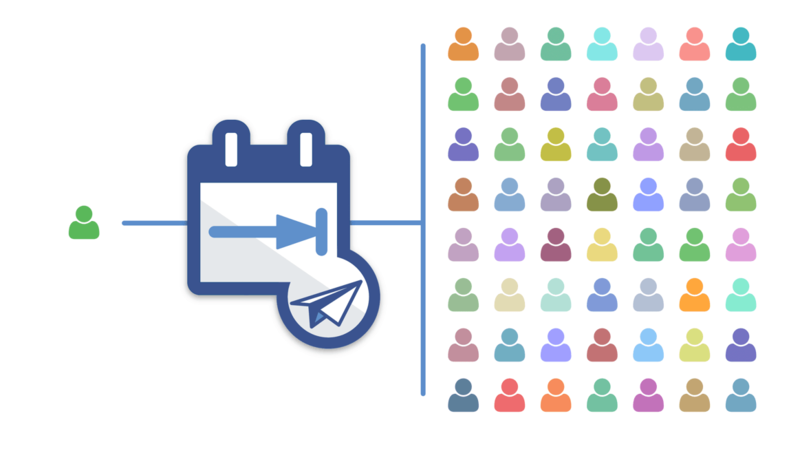 Once you create a share, any changes made to the shared events inside DayBack will be synced to that share. This only applies to changes made in DayBack's interface: changes made outside DayBack (in your other FileMaker layouts, for example) won't be synced until that event is again edited in DayBack's interface or until you manually update the share. When a recipient opens a shared URL, DayBack reads the shared events from the "export" on our server instead of from your original data source (your FileMaker file). Share recipients have no access to your original data source and no access to events that weren't visible when you made the share. When exporting an event, DayBack only sends the information you can see in the view you shared and the information you can see in the event's popover (what you see when you click on an event). Other attributes of the event, or attributes of records related to the event, aren't exported to the share. Can recipients edit shared events? No. Recipients of a share URL will be unable to edit those events. If you want someone to be able to edit your calendar they'll need a DayBack Online account in your group. Here's how to invite them. Do recipients need to have accounts in my FileMaker Solution? No. Folks opening a share URL don't need any information from your FileMaker solution and DayBack never hits your FileMaker Server when folks open a share. You don't even need to have a FileMaker Server. Can I limit sharing or turn it off? Sure. You can limit sharing to certain users by editing the $$sc_SharePrivileges variable at line 18 of the DayBack script "Load Calendar Settings - On Startup --- Edit Configuration Here ---". Set that to "off" to turn sharing off altogether, or wrap "everyone" in an If() statement that only permits some users access while returning "off" for others. Setting this to "Admin" will enable sharing for just Full Access users. You can also just remove the sharing tab for some users by including "Share" in the $$sc_HideMenuItems variable at about line 63 in the same script. Be sure to run the "Upon Opening" script after you've changed "Load Calendar Settings..." to see your changes take effect. Can I style shared views differently from DayBack in FileMaker? Yes. Just as you change DayBack's appearance by editing its CSS in your FileMaker file, the share uses the CSS in your DayBack Online account. This means you can have separate CSS for your FileMaker solution, and your shares. Here's how to edit the CSS in DayBack Online CSS mods in DayBack Online. Note that if you have regular DayBack Online users (named users with DayBack Online accounts) and shared users, you can make style changes in DayBack Online that only affect the shared pages by wrapping them in the class ".share-only"